The number of exam grades that were changed after being re-marked has dropped by 25 per cent this year, with fewer schools and pupils also requesting reviews following sweeping reforms by Ofqual. Figures released this morning by the exams regulator show the total number of reviews of GCSE and A-level marks decreased from 572,400 in 2015, to 427,100 this year. 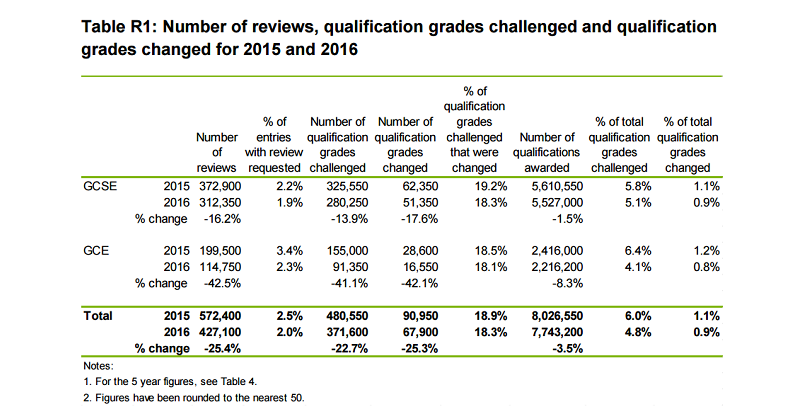 The number of qualification grades that were changed as a result of reviews also dropped by 25 per cent – from 90,950 in 2015, to 67,900 this year. Grade changes represented 0.9 per cent of all GCSE certificates awarded this year, and 0.8 per cent at A-level, compared to 1.1 per cent and 1.2 per cent respectively in 2015 – the lowest rates since 2013. Of the qualification grades changed in 2016, 99 per cent were marked up. The proportion of all A-level and GCSE grades that were challenged dropped from 6 per cent to 4.8 per cent over the same period. The changes follow sweeping reforms to the way exam boards and Ofqual handle the re-marking process, which were aimed specifically at cutting the number of appeals. Ofqual introduced the changes to prevent some pupils from having a “second bite of the cherry”. It means that exam boards can only change marks on review if a mistake was made in the original marking – not if the examiner disagrees with a decision. Leora Cruddas, director of policy at the Association of School and College Leaders, said the drop in reviews is “not surprising”. But she added: “Even under the new rules, 67,900 exam grades were not right the first time round and this is obviously far too many. Sally Collier (pictured above), chief regulator at Ofqual, said quality of marking is a “very important issue”. She said the regulator will now run a “thorough evaluation” of the changes to the review process to “help understand this year’s reviews statistics more fully” and also to check that errors “were indeed identified and corrected, and that legitimate marks were unchanged”. Of the review requests received this summer, most were what is called a ‘non-priority review of marking’ for an individual assessment mark. 306,600 such requests were made for GCSEs, and 82,800 were made for A-levels. For ‘priority reviews’, requests to re-mark individual exam papers, 2,250 were carried out at GCSE level, and 29,700 at A-level. There were 1,550 reviews of suspected administrative errors at GCSE and 875 at A level, while reviews of moderation totalled 1,950 and 1,400 at GCSE and A level respectively. I think there’s an extraordinary discrepancy here between Ofqual’s changes to remarks which as you report here have led to a significant drop in requests, and their recent report that suggested that half of English Lit and almost the same proportion of History students were awarded the wrong mark. If so, why discourage remarks in the way they have? We can have no faith in the validity of the system when such glaring inconsistencies both of purpose and outcome are emerging.